This article was written by Nick Dearden. Nick is the director of the social justice campaigning organisation, Global Justice Now, one of Jubilee Scotland’s member organisations. I was in Quito, Ecuador, on 15 September 2008, the day investment bank Lehman Brothers collapsed and the financial crisis exploded. Appropriately enough, I was there to celebrate Ecuador’s ‘debt audit’, a process through which Ecuador meticulously examined the debts it had accrued largely through previous financial crises. The audit was a lesson in how the financial system works, and how overly-powerful finance benefits the very wealthy and fuels inequality in society. It is also prone to crisis, and when these crises come, the debts created by a tiny section of society are forced onto the rest of us, with the poorest bearing the greatest weight of all through austerity, privatisation and massive debt repayments. Ecuador’s government used the audit to wipe out billions of dollars worth of ‘illegitimate debt’, and it put in place new laws to control finance. Sadly, those lessons were not learnt by the vast majority of other countries that were about to plunge into recession and debt. The financial crisis was rooted in a global economy which had come to worship financial power. It’s no surprise that countries like the UK and US fell to the crisis first, as they have always been the most committed to a system where finance becomes an end in itself rather than helping businesses invest or helping governments or social enterprises build better countries. Ten years on, we’re still living with the consequences. The financial crisis cracked our free market economic model known as neoliberalism, and those cracks have grown into chasms, out of which crawled the eurozone crisis, Brexit , Trump and the emergence of authoritarianism around the world. How can we get out of this mess? If the problem is financial power, then surely the answer must be definancialisation. This entails, of course, serious financial regulation. But we’re still heading in the wrong direction, and Trump is tearing up even Obama’s tepid reforms, while finance in Europe is begging for more freedom. We must make sure banks are forced to behave responsibility, to think long-term, and to shrink. The establishment of public banks and support for cooperatives and local banks, serving local community needs, is vital too. We must reverse the trend of introducing financial markets into every aspect of life by building strong, democratic public services and public institutions. Short-term profit maximisation has no useful role to play in the provision of healthcare or education. But neither does it play a useful role in creating a sustainable energy system, in building good quality housing for all, developing new medicines, or even in developing the new technologies which will underlie the economy of the future. We must look to new forms of ownership, even reinventing the ‘commons’ as a system of collective ownership and control over large swathes of our economy. Globally, we must stop letting financial and corporate power exploit the world. Rather than telling governments in the Global South ‘you need more investment, let the market work its magic’, we need to support them in regulating and taxing that investment, which is the only way to make investments genuinely useful for a country. Rather than encouraging more unregulated capital flows, aid could be used to help the construction of public services, local economies, taxation and regulation. None of this should be seen as utopian. Here in Britain we carried out a similar task after the second world war when we recognised that the financial markets had failed to produce the healthcare, the education and the housing which people in our country needed to live a dignified life. 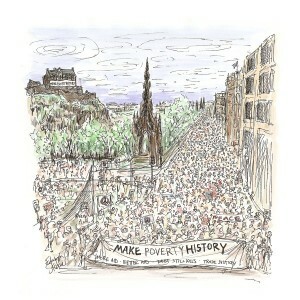 Poverty was slashed, inequality shrank, crises were reduced. But we can’t sit back and wait for the political establishment to come to its senses. Only an economic justice movement can ensure real change happens. That’s the long-term battle we’re engaged in. And the change must be international. It’s understandable that at this moment politics has become very domestically-focussed. But the big changes we need can’t happen only at that level, they must be global. You can’t make life better in Britain by trampling on the rights of those elsewhere. The financial crisis signalled the slow death of the financialised economy. It’s up to us to build something better.